Driving lessons in Thame, Oxford, Aylesbury, Long Crendon, Haddenham, Wheatley, Chinnor, Princes Risborough and surrounding areas. Hi I'm Steve, I am a fully qualified Government Approved Driving Instructor (ADI) and I am passionate about road safety. I teach a wide range of students, from beginners starting out, foreign licence holders wanting to pass the UK driving test and I also train driving instructors as a registered ORDIT trainer. I have been involved with road safety since 1982 when I was a volunteer instructor with the RAC/ACU motorcycle training scheme. Driving is a key skill that allows us to make the most of our flexible and busy lives, so a good foundation helps keep us and other road users safe. Helping people acquire these skills is what makes my job so enjoyable. I am local, having lived in Thame for more than 25 years I'm married and I have two sons who both went to Lord Williams’s School. As with all ADI's I hold a current DBS Certificate. 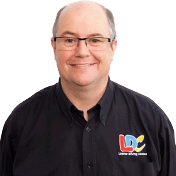 I choose to work with LDC because everybody is different and the LD System allows for flexibility in lessons so that you learn to drive safely at a rate that suits you. I aim to make every lesson enjoyable and as productive as possible. The LD System just helps me to do this more effectively. There are a lot of people who have found success learning to drive using the LD System with me, click on my facebook link to see the latest happy drivers - you may even know some of them!